Almost half of all the exhibitors consisted of manufacturers with whom traders made direct contacts. A presentation of 242 exhibitors from 21 countries showcased collections by 520 fashion brands. During the three trade fair days, approximately five thousand professional visitors attended the fairs, mostly members of the STYL and KABO Visitors Club with the benefits of free entry and parking. The Brno Fashion Fairs are the only B2B presentation of the fashion industry for the Czech and Slovak markets. Retail sales in the industry have been growing for several years, bringing a number of new exhibitors targeting Czech and Slovak businessmen and consumers to the Brno Exhibition Centre. The participating countries included first-time participants or returning exhibitors from Iran, Pakistan, Bulgaria and Romania. Many interesting brands had their premiere here, for example from Turkey, Italy, Spain or India. The number of countries represented increased to 21, the total number of foreign exhibitors reached a record 39%, and most of the foreign stands belonged to companies from Germany, Poland and Slovakia. The STYL fashion fair occupied Hall P - the largest and most modern hall of the Brno Exhibition Centre. Visitors found exhibitors of both women's and men's clothing, fashion accessories and costume jewellery. 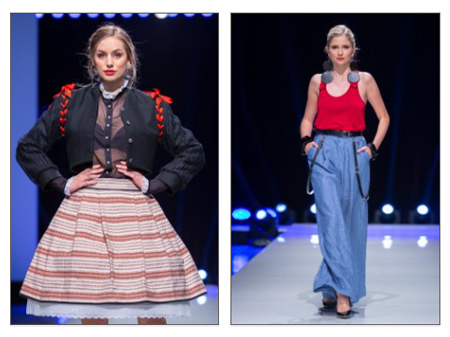 The newly introduced Design Street section featured stands of designers from the Czech Republic, Slovakia and Spain, who, besides the designer collections and individual orders, also produce small-collection garments and supply the retail network. The supporting programme took place in the Programme Centre with a catwalk open towards the centre of the hall. Four times a day, visitors could enjoy one of the professionally prepared fashion shows. The men's and women's fashion shows, collections of clothes and beachwear, and a speciality of this year's fashion show, a designers show. On Saturday, the Program Centre became the venue for the only domestic trendline seminar with a foreign speaker. The Dutch designer and trending forecaster Ellen Haeser lectured on current trends and a new approach to fashion based on sustainability, personal style and clothing exclusivity. "The dictatorship of fashion has come to an end, it is important to choose one’s personal style. As tradespeople, we should educate our customers to help them choose their personal style," Haeser said. The presentation was followed by a commented fashion show of fashion pieces which Ellen Haeser selected from the exhibitors’ collections. The KABO Shoe and Leatherwear Fair was located in the neighbouring Hall F. Just like in August, the KABO relaxation and consulting centre in the middle was surrounded by exhibition stands of the premium brands of footwear. This is where a ceremony was held on Saturday, during which four companies received certificates of Czech Quality, the Žirafka - Healthy Children's Shoes and Comfortable Shoes. On Sunday there was a workshop of vocational schools in the shoemaking and haberdashery industry. The organizer of both events, the Czech Footwear and Leather Association, celebrates 25 years since its foundation this year. Both trade fairs also featured free counselling centres that were available to visitors, where exhibitors and visitors consulted their problems with court experts as well as experts from testing institutes and professional associations. On the occasion of the fashion fairs, the Svět textilu & obuvi magazine (The World of Textiles & Shoes) has awarded a prestigious award to two prominent personages of the sector for the first time. Mr. Otakar Petráček, Chairman of the Board of MILETA - the leading European manufacturer of shirts, became The Person of the Year 2018 in the textile and clothing industry. The footwear and leather industry and commerce Person of the Year 2018 award went to Alois Šůstek, the owner of FARE, a successful producer of children's shoes. A unique seminar titled "The Master Exam in Tailoring" was held during the fair and discussed the rules of professional exams for the re-introduction of the prestigious Master of Crafts in tailoring. Tradesmen and owners of tailor's salons met here for the first time and commented on the master test parameters and also agreed on the need to create a branch guild association. Our company has been exhibiting at the KABO trade fair for many years, presenting both the Italian branded handbags we import as well as our Facebag brand. This year we have at least ten new designs of our own production, and so we expect progress in this respect from the commercial point of view. For three years, we have been representing the well-known Dutch brand Bullagi on the Czech and Slovak markets, and so we are also here at the KABO trade fair. These are handbags that are not made of leather but of quality impregnated materials. We are satisfied with the fair; many visitors came to our stand especially on Saturday. The STYL fair definitely has its place here. The Czech retail that deals with fashion needs it, and garment manufacturers should be presented here. I was twice awarded the Gold Hanger at STYL as early as in the 1990’s, I was here with a different company then. I am very glad of the Person of the Year award and I am proud of it, I perceive it as an award for our whole company. We come to STYL regularly every six months and it is an opportunity for us to introduce our range of products as well as current novelties to our dealers. We are attending KABO for the third time, we meet new buyers from the Czech Republic and Slovakia here. Traders are cautious when introducing new brands, but when someone starts cooperating with us, they are usually satisfied and they return. The fair is also important for us because we are here to find out what the Czech and Slovak market likes. There are many of our customers coming to KABO, we can meet them and present all the innovations to them. We have been exhibiting here for eight years and we have been offering student backpacks for the fourth year. As a wholesaler, we mainly deal with stores with healthy children's footwear and leather haberdashery. I returned to the STYL fair after fifteen years. I went to Brno without specific expectations, rather with openness to new contacts and people. I met many kind faces here, the buyers and direct customers came to see us, so everything is fine and how it should be. I started my career at these fashion fairs, and so STYL is a matter of the heart for me. The STYL fair helped me in the beginning, as a fresh graduate, I received awards, I was a member of the jury, I had fashion shows, and it was the top fashion event of the Czech Republic for me. That's how I feel it and I love it here. This year we continue in building our contacts with both Czech and Slovak customers. We took part in the fashion shows and we were very pleased that the Dutch fashion specialist Ellen Haeser noticed us in Brno and selected our designs for her lecture on current trends. This is my first time in Brno and this fair is a new environment for me. I like the variety of brands that are here, and I am pleased with the fashion show I was invited to participate in as a winner of the competition organized by ANDE, the Association for New and Young Spanish Designers. The 54th STYL and KABO fairs will take place on 24–26/8/2019.